The Mt. 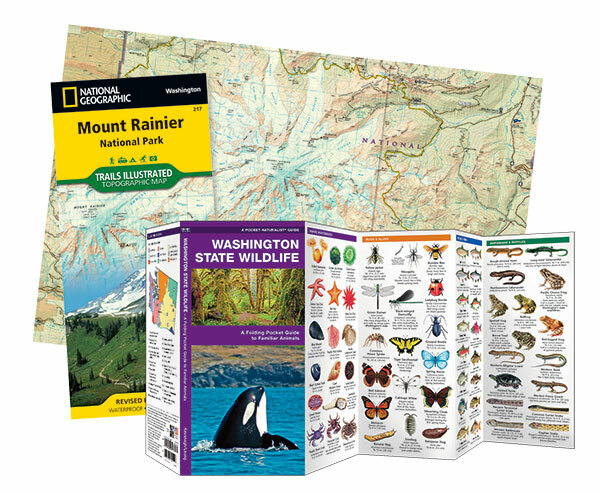 Rainier National Park Adventure Set consists of a Pocket Naturalist Guide and National Geographic Map, offering a perfect resource for travelers wanting “hands on” information on what to see and where to go to find some of the world’s most dramatic natural attractions. Waterford’s Washington State Wildlife offers visitors or armchair travelers the information needed to identify some of the area’s most significant and impressive animal life. Beautiful full color illustrations on the 10 panels highlight more than 140 species with descriptive text indicating distinguishing features, scientific names and measurements. It is the perfect pocket reference that is easy to use while exploring through this amazing park. It is packaged with National Geographic’s Mt. Rainier National Park Trails Illustrated Map, a folded waterproof map that provides global travelers with the perfect combination of detail and perspective. Highlighting hundreds of points of interest and the diverse and interesting wildlife, this map also contains detailed topographic information, plus useful traveling tips, and regional information.